NEW YORK — Anthony Fitzpatrick, PhD, a Principal Investigator at Columbia's Zuckerman Institute and Columbia University Irving Medical Center (CUIMC), together with scientists from the Mayo Clinic and Boston Children's Hospital, has been awarded $11.3 million to map the three-dimensional structures of protein tangles that accumulate in the human brain. These tangles are believed to play a critical role in the progression of a variety of deadly neurodegenerative diseases. Using cryo-electron microscopy (cryo-EM), for which Columbia Professor Joachim Frank, PhD, shared the Nobel Prize in Chemistry in 2017, Dr. Fitzpatrick's team will focus their efforts primarily on tau tangles, clumps of misfolded tau protein that have been implicated in a host of diseases, most notably Alzheimer's disease and chronic traumatic encephalopathy, or CTE. By reconstructing the structure of tau tangles in these diseases — atom by atom — the researchers hope to gain new insight into how tangles form, how they grow and how they drive disease progression. These findings will enable researchers to design drug molecules that prevent tangle buildup. They will also aid development of new biomarkers that detect the disease early, before symptoms arise. Dr. Fitzpatrick will serve as lead principal investigator of this five-year project, which will be administered by the National Institute of Neurological Disorders and Stroke (NINDS). He will be joined by Leonard Petrucelli, PhD, Chair and Professor of Neuroscience at Mayo Clinic's Florida campus, and Judith Steen, PhD, Associate Professor of Neurobiology at Harvard University and Boston Children's Hospital. "The brains of advanced Alzheimer's or CTE patients are often replete with tau tangles," said Dr. Fitzpatrick, who is also Assistant Professor of Biochemistry and Molecular Biophysics in the Taub Institute for Research on Alzheimer's Disease and the Aging Brain at CUIMC. "But all efforts to rid the brains of these tangles have come up short. This failure ultimately stems from a lack of understanding of the tangles' unique molecular signature for each neurodegenerative disease. With this generous support from the NINDS, we can now expand our cryo-EM program to accelerate discovery and overcome this gap in knowledge." This project builds on previous work by Dr. Fitzpatrick and others to decode tau. In 2017, Dr. Fitzpatrick became the first person in the world to map the three-dimensional structure of tau protein tangles, which are highly abundant in the brains of Alzheimer's patients. To do so, he used cryo-EM, the revolutionary imaging technology that fires beams of electrons at protein molecules that have been frozen in solution to deduce the protein's structure. 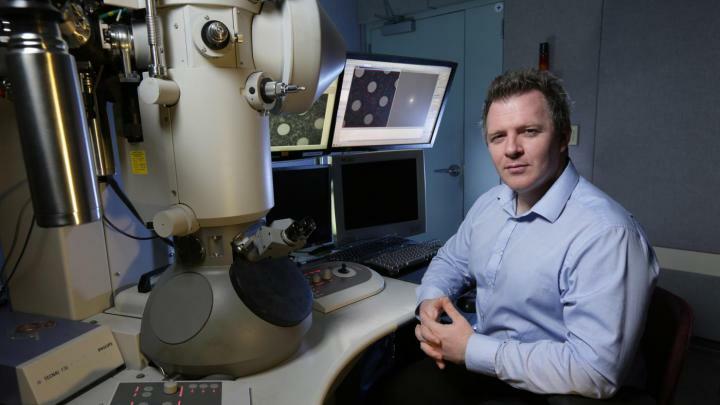 "With cryo-EM, we first capture snapshots of a protein complex from different perspectives, and then painstakingly reconstruct its three-dimensional structure," explains Dr. Fitzpatrick, who was the recipient of the Thermo Fisher Scientific 2017-2018 Young Investigator Award for cryo-EM and is a Dana Foundation David Mahoney Neuroimaging Fellow. One such tauopathy, CTE, has been of particular interest to the scientific and medical community. Like Alzheimer's, CTE is characterized by the abnormal accumulation of tau tangles. Unlike Alzheimer's, CTE is caused by repetitive head trauma. A July 2017 study of the brains of 111 ex-NFL players revealed that 99% showed signs of CTE; their brains were riddled with tau tangles. "If we can understand how CTE progresses at the molecular level, we could use that knowledge to develop better diagnostic tools to catch the earliest signs of CTE and intervene in a way that slows down or even halts disease progression," says Dr. Fitzpatrick. By deciphering the molecular signatures of these two forms of tau tangles, the researchers can then determine how any similarities — and differences — between the two structures impact disease progression. This information will prove critical for developing drug molecules that eliminate tau tangles — and potentially improve cognition. The researchers will use this approach as a paradigm for continued and expanded efforts into other tauopathies, as well as the abnormal accumulation of TDP-43, a protein implicated in frontotemporal lobar degeneration (FTLD), which, after Alzheimer's disease, is the second most common cause of dementia. Total award: $11,342,470 over five years. Judith A. Steen, PhD, Associate Professor of Neurology at Harvard University and Director of the Neuroproteomics Laboratory at Boston Children's Hospital.